Well, it doesn't look like Vanderpump Rules' Schwartz is afraid of commitment anymore. On Tuesday, Katie Maloney and Tom Schwartz announced their engagement via Instagram. Not only is Katie super happy and thrilled with her ring, but so are her Bravo castmates. Soon after Katie and Schwartz revealed their exciting news, many of their close friends and fellow reality stars took to social media to express their congratulations. Before you ask, no, Stassi Schroeder did not wish the two a very happy congrats on their big news. With that said, there's still a good chance she could be the bigger person and say "Congrats, Katie & Tom" eventually, but that has yet to happen. 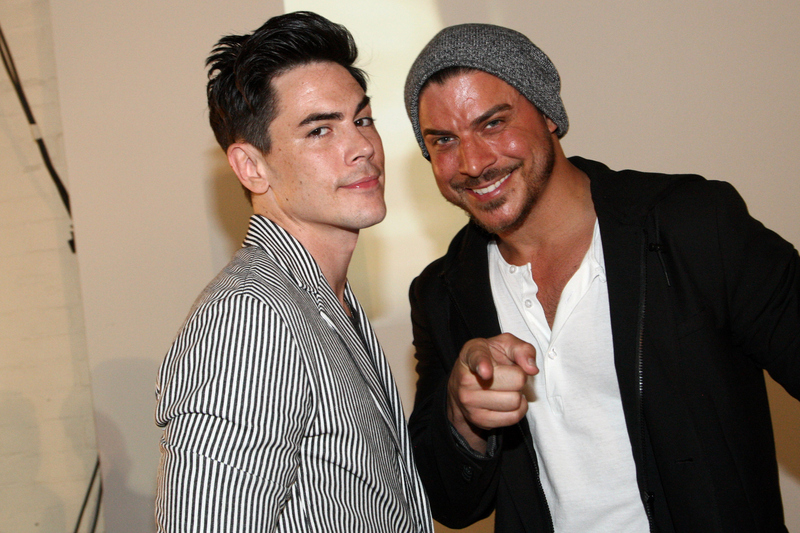 However, Jax Taylor, Tom Sandoval, Scheana Marie, Ariana Madix, Peter Madrigal, and Kristen Doute (yes, even Kristen!) either took part in the engagement or signed onto social media to send all their love to Katie and Schwartz. Now, let's hope that we get to see the engagement action on the small screen during the next season of Vanderpump Rules, which will hopefully exist, because it would sure be a must-watch moment. Also, *fingers crossed* Schwartz didn't cause some kind of drama during the proposal. Based on these photos, it sure doesn't look like it. Just kidding, but you know she's totally not feeling it.